Turkmenistan is an energy giant with the fifth largest gas reserves in the world although regrettably for CMI Offshore Ltd the majority of gas reserves are firmly onshore. CMI Offshore established offices in Turkmenistan in 2009 but through the expertise of it local management, led by Country Manager Fatima Abdullaeva, has a track-record of over 20 years. 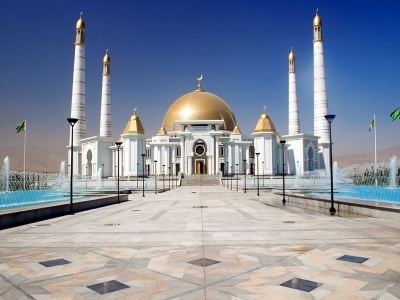 Our Head Office in Turkmenistan is located in Ashgabat, the capital and administrative centre of this country of 5 million people. Our operational office is in the port of Turkmenbashi which is the Caspian gateway to Turkmenistan and the central hub of the offshore oil and gas sector. We are proud that we have been able to operate with a 100% Turkmenistan content since the first arrival of our Turkmenistan vessels in the Caspian in Autumn 2009. The initial contract for our local operation was to provide a package of 3 modern 45 ton bollard pull tugs together with barges and a supply vessel to support Petronas 2010 pipelay and field development and since then we have worked on a variety of projects with our Turkmenistan fleet and also bringing vessels from our other Caspian operations to operate on specific requirements in Turkmenistan which have included shallow-water and transition zone seismic operations for BGP China / RWE, and a selection of construction support tasks for Ilk Insaat contracts with both Petronas and Dragon Oil. In 2014 Dragon Oil awarded a 4 ship contract to CMI Offshore for AHTS and Standby Vessels for the two fields in the Cheleken Contract Area. These new ships have now been mobilised to Turkmenistan and represent some of the most modern ships in the Turkmenistan flag. CMI Turkmenistan can provide vessels to meet all maritime requirements the Turkmenistan sector of the Caspian Sea including mobilisation of new vessels from outside the Caspian for longer-term contracts and bringing vessels in from other Caspian sectors for shorter-term business. With a dedicated onshore team of industry specialists and technical experts we provide full support in-country for marine operations and our local crew can provide the highest levels of marine operation. We take pleasure in the knowledge that our commitment to local operations enables us to retain the best people and that we have an ongoing practical training programme which includes sending all our Captains and First Officers to international centres of excellence for Simulator Training. All our crew are internationally certified and our Standby Vessel specialists are also trained internationally and to the highest standards.